The slasher film can be such a formulaic story that writers in their search for a new angle turned to ‘theme’ killers; birthday killers, underwater killers, assorted holiday killers, killers who used all manner of power tools. Sometimes it worked, most of the time it was the only notable thing about the film. 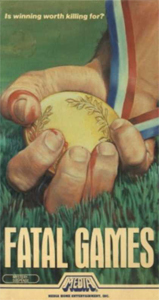 ‘Fatal Games’ attempts to spice up their slasher movie and cash in on interest in the 1984 Summer Olympics by having a sports themed killer who favors a javelin as their weapon of choice. It comes perilously close to continually repeating a scene from the slasher comedy, ‘Student Bodies’ (1981) and occasionally treads on another sports slasher, ‘Graduation Day’ (1981). It opens with an unending opening theme song that keeps telling me to, “Take it to the limit.” and “Winning isn’t everything, it’s the only thing.” ‘Fatal Games’ takes place in at a training facility where teens are training for ‘The Nationals’ which is code for, ‘We didn’t want to pay for the rights to The Olympics.’ The kids are being given steroids, some other drugs to stave off puberty, as well as being punished with grueling schedules and unforgiving instructors. There are some wacky shenanigans involving food fights and a sports doctor who likes to get a little too touchy feely with the other girls. Eventually the film settles down to business, and that business is putting javelins in people. There’s also some sports drama, a little romance, and some interpersonal conflicts, but this is all paper thin and tedious and thankfully tossed away for pretty crazy finale. ‘Fatal Games’ doesn’t serve up anything particularly new for a slasher movie. What it does offer is unintentional comedy because the intentional comedy sure doesn’t deliver. The opening theme song is ridiculous and coupled with the first ten minutes of the students attempting humor, I wasn’t sure if I was supposed to be watching a comedy or not. Future slashers take note: It’s difficult to take you seriously when all you wear is a scary black track suit and a hood. A killer that only stalks a gym kind of limits things and I wish they would just have gone all out and had him doing people in with a variety of sports equipment. There’s a brief moment of hope when he picks up a shot-put, but nothing ever comes of it. There are a few highlights, and by that I mean shower scenes. The single best stalking sequence involves the killer decked out in scuba gear and standing at the bottom of the pool, javelin at the ready as he watches a girl swim laps. It’s an unusual idea, tense and shot very well. The finale is fun and although I didn’t feel the killer was too difficult to guess, the movie attempts a reveal that is reminiscent of Sleepaway Camp (1983), albeit less horrifying and twice as silly. It’s not going to change your mind about slasher films, it’s juvenile and pretty dumb but it keeps things moving and never really delves into cruelty. It’s a good for a group viewing and has that particular brand of 80’s silliness. Looks like fun! Love the cover too.